Australia, 20 August 2014: The last Monday of October is ASCA’s annual Blue Knot Day. This year, on the 27th October, Adults Surviving Child Abuse (ASCA), asks all Australians to unite in support of the estimated five million Australian adult survivors of childhood trauma[i]. Blue Knot Day, ASCA’s National Awareness Day, provides hope, optimism and pathways to recovery for the one in four adults affected by childhood trauma[ii]. This year’s Blue Knot Day theme is ‘recovery is possible’. With the issue of child abuse being so prominent, ASCA is calling on the community to get involved – whether it is an activity in someone’s home, a church gathering or a company event, the participation of the wider Australian community can make a huge difference. ASCA President, Dr Cathy Kezelman, said: “Through the Royal Commission and other inquiries Australia has borne witness to some confronting stories of child abuse. In the past few years, cases once hidden have finally come to light. We need to make sure that everyone knows recovery is possible and there are people who can help. “In order to have a strong support system in place, education and training is urgently needed for health professionals and organisations working with adult survivors of childhood abuse and trauma. The Royal Commission’s findings have revealed it takes survivors an average of 22 years to tell someone about their abuse[iii]. The Blue Knot Day initiative aims to raise awareness of the importance of education and training for practitioners and make this a topic that individuals and the wider community can talk about more openly. By visiting the ASCA website communities can find out how they can get involved with the Blue Knot Day events that help adult survivors reconnect with their families, friends and communities. ASCA also urges individuals, organisations and workplaces, to get involved by donating to ASCA this Blue Knot Day at http://www.givenow.com.au/blueknotday. All funds raised will help support the primary prevention work of ASCA through professional training for healthcare professionals and services, education for the community and support for survivors of childhood trauma and abuse. 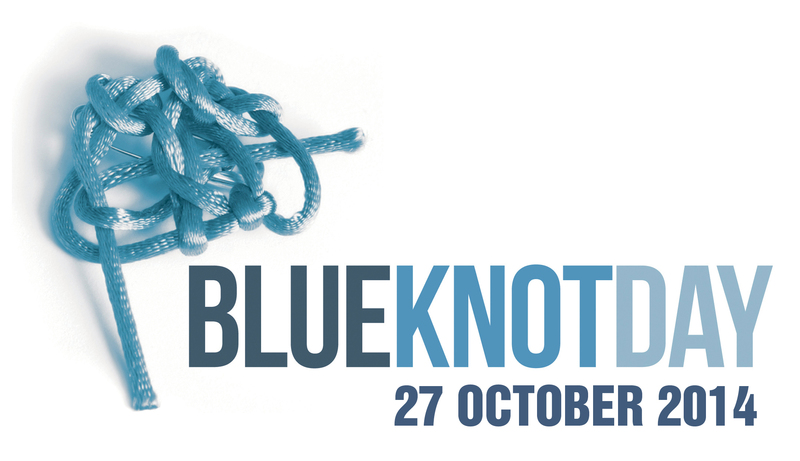 The full range of activities held during Blue Knot week (October 27th – November 2nd), with details, will be added to the website progressively over the coming weeks. To get involved please visit www.asca.org.au/blueknotday. · An estimated five million Australian adults have experienced childhood trauma[iv]. · In Australia, one in three girls and one in six boys is sexually abused before the age of eighteen[v]. · Recent Australian research found that adults with a history of childhood abuse suffer from significantly more health conditions, incur higher annual health care costs and are more likely to harm themselves. The results suggest that child abuse has long-lasting economic and welfare costs. The costs are greatest for those who experienced both physical and sexual abuse[vi]. · Australian studies show that child abuse survivors are almost two and a half times as likely to have poor mental health outcomes, four times more likely to be unhappy even in much later life and more likely to have poor physical health[vii]. · Global data found that 90% of public mental health clients have been exposed to multiple physical or sexual abuse traumas. Without intervention, adverse childhood events (ACEs) result in long-term disease, disability, chronic social problems and early death[viii]. [i] Estimated from a range of key sources placing the figure at 5 million adult survivors of childhood trauma. [iv] Estimated from a range of key sources placing the figure at 5 million adult survivors of childhood trauma.